As an ardent Lucy Maud fan this has shot to the top of my reading list, Lyn. Much of the story I'm familiar with but it will be fascinating to get Rubio's impressions as she edited the Journals. Thank you! You're welcome, Rose. As you're an LMM fan, I think you'll be amazed by Rubio's experiences as editor. I knew nothing at all about LM Montgomery's life, so this sounds interesting (and rather sad). I think LMM was definitely an author who lost herself in her work to distract herself from the misery of her life. It's fascinating to see her own view of her life & then read a more objective view in the biography. What a fascinating post. I didn't know that Montgomery's journals were published, but will have to look them out now. Reading your post, it struck me that there were parallels with her own Anne Shirley, evidently inspiration from real life. I'm so sorry though that by the sound of it she had such a sad life, as you're right, her books are so sunny. Yes, I think she enjoyed giving her orphan heroines a happy family life. Although her father was still alive, she had very little to do with him (a visit to his new family didn't go well) & I think she enjoyed reinventing him in the father in Jane of Lantern Hill, for example. Her journals are fascinating. As usual, an excellent blog. 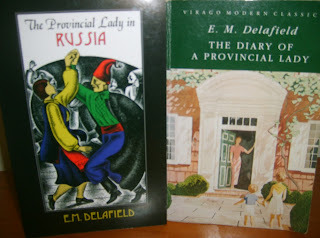 The perspective from the biography of the books written by LM Montgomery is gives more depth and interest to the sometimes sugary best known novels, which belong to the canon of the young girls and growing girls books of the end of the 19th and beginning of the 20th century - from tomboy orphan to well-mannered Mum and teacher. Lynn avoids all sensibilty to show the reality of a life and its impact over the oeuvre. An excellent blog indeed. As usual... Gifted Lynn! I think it does enhance the work, knowing something of the author's life, especially in this case where LMM used her work as wish fulfillment & escape. This is a must have book for me! I have read Mauds first journal only and hope to get all of them eventually. It is hard to fathom that someone so unhappy could write such sunshiny stories, isn't it? The Journals are so interesting & Rubio & Waterston's editing enhances the whole experience. Their footnotes & research were impeccable & that standard is maintained in the biography. The reader can tell that Rubio has researched to within an inch of her life! I think LMM escaped into her writing, whether the novels or the Journals, & it's lucky that she had that escape. Wonderful summation of a situation that has long fascinated me - the disconnect between Montgomery's books and journals. I always admired and preferred the latter, but never realized that there was also a disconnect between the journals and reality! I have this biography unread, and am now very much inspired to pick it up. Thank you so much, Lyn. Thank you, Diana! I think you'll enjoy the biography. Having read the Journals, the biography expands on the differences between the Journal;s as originally written (as far as that can be known), the versions LMM rewrote & the times when she just wrote rough notes, not writing up the entries until months later. Even more interesting were the interviews Rubio conducted in the 80s with friends, servants etc. Maud's view of a relationship or situation isn't always the only view. Surprisingly enough I've never read any of her books, though I keep meaning to. I wonder, should I read some of her books before reading her biography or journals? Well, I'd only read a couple of the novels before I started reading the Journals. It was Carol Shields, speaking at the Melbourne Writers Festival in the early 90s, that inspired me to read the Journals. I gradually read the Journals & read the last one about 6 years ago. I don't know what inspired me to pick up the biography (it's a few years old) but I think if you read the biography first, you'll want to read the Journals afterwards.